Mrs. Mike by Benedict and Nancy Freedman was published in 1947, and somehow, I am just now hearing about it! It was a Christmas gift from my friend, Ava, and it certainly got my reading off to a great start for 2016. 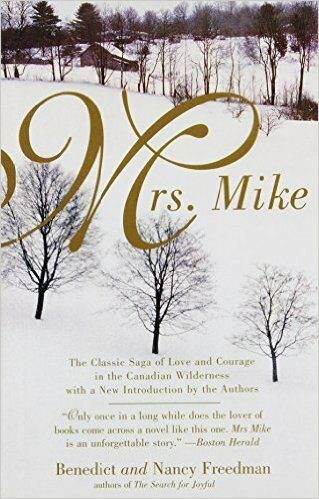 Mrs. Mike is the true story of Katherine Mary O’Fallon, a Bostonian who moves to Canada to live with her uncle because it is believed that the clear, cold air of Calgary will improve her lung condition. But while her lungs find strength in Canada, her heart also finds love. Enter Sergeant Mike Flannigan of the Northwest Royal Mounted Police – he steps in and wins Kathy’s stubborn heart with his strength, courage, and “eyes so blue you could swim in them”. At the young age of 16, Kathy marries Sergeant Mike. They immediately leave Calgary, and all connections to the civilized world, for the great Northwest Territory with its Indians, snow, and darkness. I hate to give away the adventures that follow – some touching, some heartbreaking, all exciting – because I hope you’ll read it and experience them for yourself. The book has lovely descriptions of Canada, so much so, I feel that I’ve been there. That’s the sign of a good book, when you can’t tell if you’re reading it, or living it. There is plenty of goodness in Mrs. Mike and I hope you will enjoy it as much as I did. Just be sure you read it beside a blazing fire or with a cup of coffee.